Kudumbashree Bazar Recruitment 2018 │ Kudumbashree Bazar vacancies in Malappuram District. 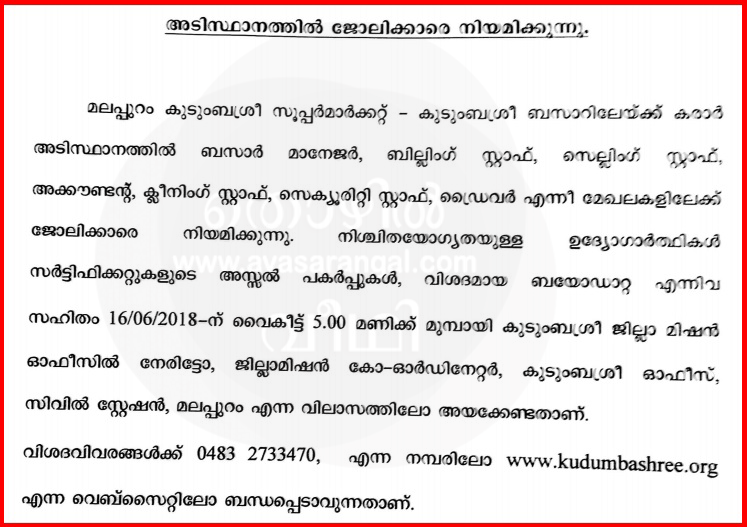 Kudumbashree Kerala invites the application for bazar manager, billing staff, selling staff, accountant, cleaning staff, security, staff, and Driver vacancies for Kudumbashree Bazar Malappuram Kerala. Interested and eligible candidates can apply in official website before 30/06/2018. You should aware of all the process of bazar manager, billing staff, selling staff, accountant , cleaning staff, security, staff, and Driver vacancy Details, like Kudumbashree Bazar Recruitment 2018 Eligibility criteria, Selection process, Age limit, Application process, Examination fees last date of application etc which are given below, The latest Kudumbashree Bazar Recruitment 2018 Online Application link attached with this article.